Nicola Mining Announces Positive Reverse Circulation Drilling Results On Historic Wastepiles | Nicola Mining Inc.
VANCOUVER, B.C., August 10, 2018 – Nicola Mining Inc. (the “Company”) is pleased to announce results on its 20-hole Phase 1 Reverse Circulation drill program (“Phase 1 RC Program”) completed between May 23 to June 8, 2018, at its wholly-owned New Craigmont Project, located near Merritt, British Columbia. 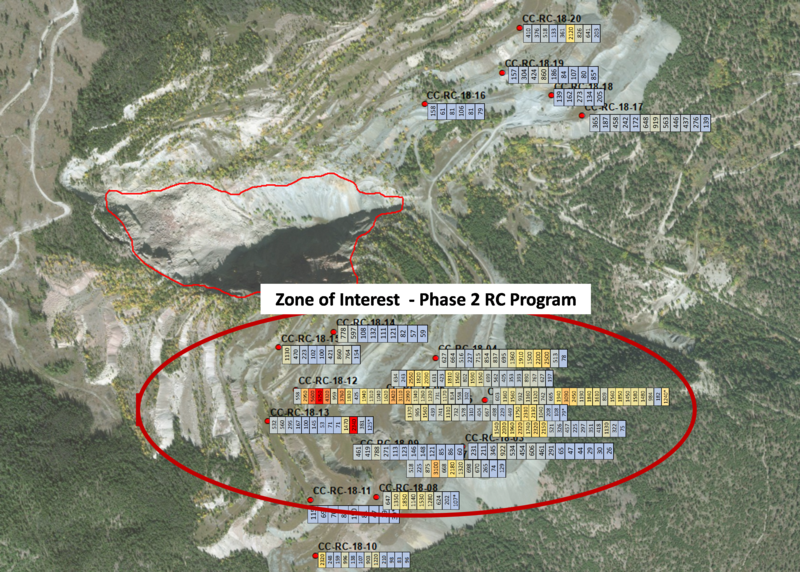 The Phase 1 RC Program provides a simple overview of copper grade and sectional volume of the approximate 80-90 million-tonne historical wastepile surrounding the Craigmont Mine pit, as well as insight if any sections merited further exploration. The Phase 1 RC Program also added to positive 3060-Portal RC drill results, as announced in the September 26, 2017 news release. Given that the wastepile material was placed in benches there would be no direct mining costs associated with production. On October 3, 2016, the Company announced that it had entered into an Exploration and Material Purchase Agreement with Teck Highland Valley Copper Partnership (“HVCP”), a wholly owned subsidiary of Teck Resources Limited involving mine strip material (refer to Oct. 3, 2016 news release) surrounding the historic Craigmont open pit. A clear zone of interest has been found in the largest volume section of the wastepiles, which is located on the southern side of the pit. The Phase 1 RC program found the south-central quadrant contains the thickest and most potentially economic grade for the waste piles. 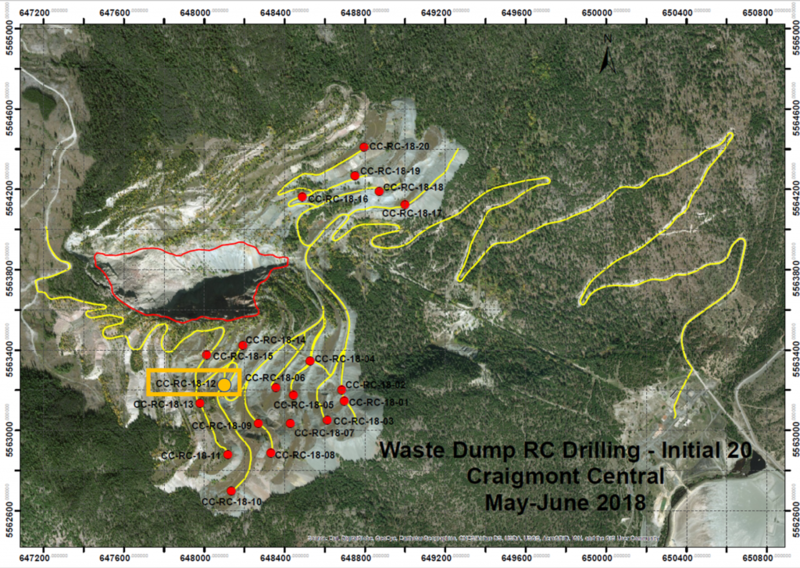 Results have warranted a follow up program (“Phase 2 Program”) to delineate copper mineralization and trace the extent of the higher grading material within the waste piles. The Company recognizes that an approximate 100-hole Phase 2 Program will provide only conceptual quantity and grades and will be insufficient data to complete a NI 43-101 resource. Phase 2 will however, be able to provide insight into approximate in-situ calculations based on volume and grade. The Phase 2 Program will include additional holes at Portal 3060 which were not completed during the 2017 exploration program. The Company has the funds to complete the entire Phase 2 DrillingProgram. Peter Espig, Chief Executive Officer of the Company, commented, “The Phase 1 RC Program proved extremely valuable as it provides us with insight into the significant potential of the mine strip material surrounding the historic pit. We are encouraged that grading of the wastepiles are associated with location and not depth, which limits waste rock and allows the Company to focus on the eastern side of the historic pit. In addition, because the largest cost of mining, which includes engineering, infrastructure, surveying, and blasting have all been incurred, the value of the wastepile is significant and warrants a follow up Phase 2 Program. The Company implemented a quality control program for this program to ensure best practices are utilized for sample collection and analysis of RC cuttings. Samples were collected at 2.0 m intervals down hole with lithology, alteration and mineralization documented for each interval. Quality control measures include insertion of standards and duplicates into the sample stream at a frequency of 1 blank and 1 standard for every group of 20 samples, and field duplicates at a rate of 3 per 100 samples. Activation Laboratory (ISO 17025 Certified) in Kamloops, British Columbia conducted sample analysis using ICP Aqua Regia 38-element (IE3) and fire assay gold (IA2) packages. Certified reference standards and rock blanks were placed in the sample stream with a ratio of approximately one sample out of 10. Kevin Wells, P.Geo, a consulting geologist to the Company is the independent qualified person as defined by National Instrument 43-101 – Standards of Disclosure for Mineral Projects for the technical disclosure contained in this news release.